In our previous blog post, we discussed the top three sections of your Schedule C form. If you are a sole proprietor, then you will need to prepare and file a Schedule C every year that you are in business. This is to show the IRS whether you had taxable profit or deductible loss during the past year. While this form may not seem that important, even the smallest mistakes can lead to the IRS knocking on your door and requesting an audit. Yikes! Should that happen to you, make sure to contact the IRS tax attorneys at Tax Law Offices. When filling out a Schedule C, there are a few sections you will need to know how to fill out before you be sure that your taxes have been filed correctly. The first three are your income, your business expenses, and the cost of the goods you sold. Today, we are going to cover the final two Schedule C sections and what you need to know in order to fill them out fully and properly. If you have any vehicles that you use for your business, this section is where you would provide the IRS with any information necessary about these vehicles. The IRS will use your answers here to determine whether or not you have a legitimate vehicle deduction. Therefore, it’s essential that everything you include about your vehicle is thorough and honest. You will need to have written documentation for your deduction because if you answer “No” on your form, the IRS will almost certainly ask you to justify the deduction. Membership dues for professional organizations: If you need to pay to be considered a resource in your industry or continue your education through a professional organization, this can count as a business expense. Subscriptions to business publications: You can learn more about business and how to more successfully run your own. Any paid penalties for nonperformance of a contract. Fees you paid to any credit card companies in order to process your customer’s card transactions. Business-related gifts that you provide to clients, suppliers, contractors, and any other professionals who you may work with. 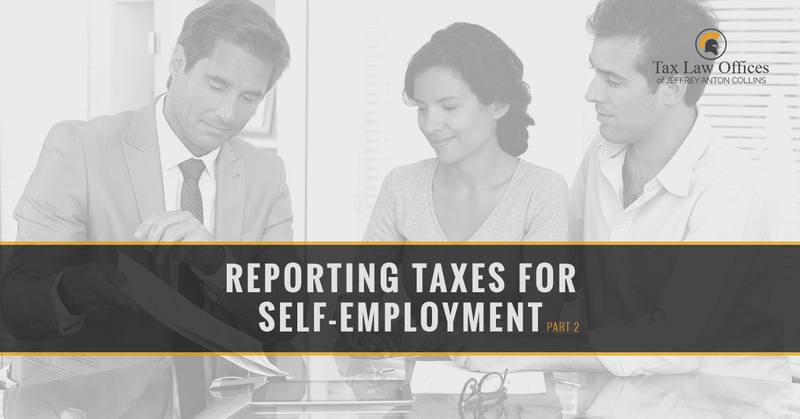 Being self-employed can be extremely rewarding, but we also understand the challenges that can come with navigating tax season successfully. We recommend hiring an accountant or another tax professional to ensure that you file everything correctly. If you made the unfortunate mistake of misfiling something and now the IRS is looking to audit your business, don’t panic. You can contact a team of professionals that can help you seek the best possible outcome. Call our IRS attorneys! We look forward to assisting you with your case.